If you're loud and proud Floridian Serge A. Storms, how do you follow up your very own remake of Easy Rider? You shoot your own "episodes" of your favorite classic television show, Route 66! With Coleman riding shotgun, Serge is rolling down the highway of his dreams in a vintage silver convertible Corvette, just like the snazzy car Martin Milner drove. It doesn't matter that the actual Route 66 didn't pass through Florida, for Serge discovers that a dozen episodes near the series' end were filmed (really!) in his beloved home state. So for Serge and the always toked and stoked Coleman, the Sunshine State is all the road you need to get your kicks. But their adventure traveling the byways of the Sunshine State's underbelly is about to take a detour. Someone is trying to tilt the odds in the state lottery amid a conga line of huge jackpots, spinning off more chaos than any hurricane season. With this much at stake, of course every shady character wants in. Crooked bodega owners, drug cartels laundering money through the lottery, and venture capitalists are all trying to game the system - and lining up to get their cut. They're also gambling with their lives, because when Serge and Coleman get hip to this timely (and very lucrative) trip, there's no telling whose number is up next. Throw in Brooke Campanella, Serge's old flame, as well as the perpetually star-crossed Reevis, and it's a sure bet that the ever-lucky Serge will hit it big. Winning has never been this deadly - or this much fun! Non-stop, laugh a minute thrill ride! PLEASE make this book into a movie! This book screams, nake me into a movie! The interwoven sub plots are brilliant, and the narrator brings the book to life. Classic Tim Dorsey. I liked the narrator it was very clear or to have him narrate in the style of a criminal/crime/murder show. I was off put by Serge and Coles voices. Not bad I guess but now how I had them in my head. All the little nuggets, that Tim puts in there that I assume to be "true" really adds to it. Such as the un claimed jacked pot amount. I love Tim Dorsey... I hated this narrator! I am one of Dorsey's greatest fans. one read almost all his books with Serge, Colman and sometimes Lenny. However this narration was the worst! He made the worst impersonations ever. It absolutely ruined it for me! I want my credit back. If you are a Serge fan you will love this book, a lot of characters make a return. It had me laughing out loud all the way through. I almost want to listen again. What did you love best about Clownfish Blues? The humor mixed with the macabre...Tim Dorsey is a master. If you really want to know detailed bits about Florida history and locations this is a great way to learn. A very different kind of travel guide. Tim's knowledge of the state is fantastic, mixed with the truly awe inspiring story's and quirks of 'a Florida Man'. Oliver does a great job truly excellent. Voice's and accents along with theatrical character presentations. Fantastic job. Hold on ... your in for a ride! Serge comes to the rescue AGAIN but I was sure it would turn out differently. This series is addicting! More please! This one like the last book, just didn't have the umph. At the end, I felt like the story was disconnected as far as the lottery ticket story line. More story development was needed to give it the greatness of some of Dorsey's other books. 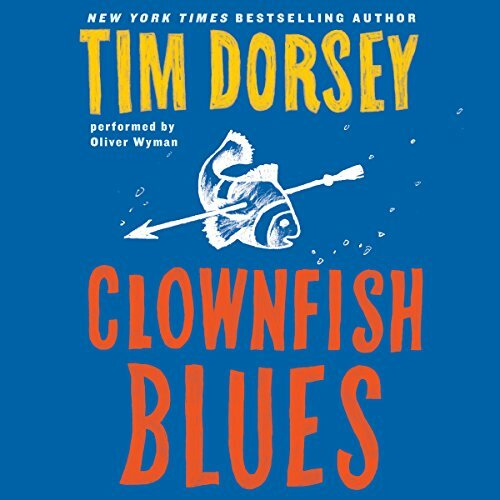 Would you consider the audio edition of Clownfish Blues to be better than the print version? Unknown. I haven't read the book. All the caricatures are unique and interesting. He completely fleshes out even small parts. Geat! Has the ability to make each caricature unique. Oliver Wyman is an excellent narrator. his voice is clear and he has a different voice for every character.